Renaissance Havanese is not a kennel or a store, it is our home. Our family welcomes serious inquiries and would be happy to set aside time for a visit, when appropriate. We strongly discourage browsing. What you get here, you cannot get for half price over the internet. Here are some things to consider when cheaper price seems like a tempting advantage. You will not be “rescuing” a puppy, but you WILL be supporting, prolonging and encouraging the pain and suffering of puppy mill dogs and their puppies. You will not receive support and advice for the lifetime of the dog, guaranteed, these people have no time for the animals they breed nor will they have time for you. You must be prepared for the result, health testing, temperament, socialization, the health of the parents, living conditions and your satisfaction are not a puppy millers concern. Prepare yourself for the consequences of a puppy bred from lack of concerns for those matters previously mentioned. If you cannot afford a Havanese from a reputable breeder, perhaps the breed is not for you. There are many puppies and dogs in shelters waiting to be adopted, many are already altered and are up to date on their vaccines. Contact your local shelter about finding the right dog for you and your family. Choose to do the right thing and do not support puppy mills. Consider your lifestyle, if a puppy is not suitable, think about an alternative pet. Many people inquire about visiting our home, they want to see a Havanese or make sure that they are not allergic, or just check us out to make sure that our dogs are well cared for happy and healthy. These are valid reasons and it is recommended that you visit your prospective breeder, when possible. EFFECTIVE IMMEDIATELY, RENAISSANCE HAVANESE WILL BE CLOSED TO VISITORS DURING A DAM’S ENTIRE PREGNANCY. However, there are times when this is not practical. When a Renaissance Havanese is expecting, we close our home to visitors. Until the puppies are eight weeks old. This is for the health of the puppies and the comfort of the new mother. There is a danger of introducing diseases such as Parvo, which can be fatal to unvaccinated puppies. These diseases can be brought into our home on your shoes and clothing. You may not even be aware that you were exposed, the risk is increased if you have visited a Veterinary hospital, a pet store, an animal shelter or a kennel within the last six months. Stress is another reason why you would not be able to visit or handle our young puppies, dams are very protective of their young, visitors can disrupt the relationship with their whelps. Although, we handle our puppies daily from birth. During these quarantine times, which begins with a dam’s heat cycle through the pups eighths week, we are happy to provide you with several references. If this policy seems unreasonable to you, even after reading our reasons, then I encourage you to find another breeder. During visits: To avoid accidental injury to our puppies, adults and children must be seated on the floor, at all times, while handling the puppies. In closing, I must point out that I would be happy to discuss the Havanese breed with anyone over the phone and provide helpful information and even assistance with referrals to other reputable breeders. Thank you so much for your understanding. My name is Veronica and I am the owner of Renaissance Havanese. I have owned and raised Havanese dogs for over a decade. The Havanese dog has truly been a blessing to our family and I was passionate about providing the opportunity for other families to experience the same joy, that we have for so many years. Ten years ago, a Havanese breeder was difficult to find here on the East coast. It was amazing that many people had never heard of this marvelous breed of dog. What they were missing! A decision to leave my career to raise a family opened the door for an opportunity to also raise Havanese dogs and I was committed to being part of the “Renaissance” of the Havanese breed! Animals were my passion since childhood. My first job was volunteering at what is now known as the Animal Embassy at the Connecticut Science Center, where I worked in the infirmary caring for orphaned wildlife. It was a wonderful adventure which reinforced my desire to assist animals. Additionally, I spent numerous years working at Veterinary hospitals with doctors who nurtured my curiosity about animals and I learned so much from being in the hospital environment. However, I found it profoundly sad to witness animals and owners in distress, and this prevented me from pursuing a career in Veterinary medicine. After a career in Public Safety Telecommunications, I was fortunate enough to be able to leave my career in order to be home and raise my family. This time also afforded me the exciting opportunity to develop my own Havanese dog breeding program and so, Renaissance Havanese came to be. Renaissance Havanese was destined to be different from its inception. My goal is to give families an experience that our own family would appreciate if we were acquiring a new puppy from a breeder. I know that choosing a breeder can be daunting. It is essential to choose someone who is ethical, qualified, committed, compassionate and honest, and that continues to be the manner in which I conduct my business. Who you choose can and will have a significant impact your precious family. The purpose of a companion pet is to bring companionship, joy, and excitement and to your family for many years! That is a serious responsibility, not to be taken lightly by any breeder. Over the years, as my family has grown, so has Renaissance Havanese. 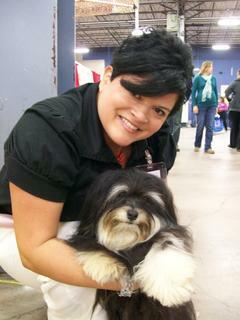 We have experienced some wonderful times together showing and handling our Havanese. My daughter Lexie was named NAKC’s Top Junior Handler for 2009 and 2010. We have made many friends and learned a great deal from some of America’s best professional dog handlers and breeders. I think what sets us apart most is the time and dedication invested in raising each litter of puppies. These are the times I find most challenging and beautiful. Early on, I am able to recognize and address any potential fears or socialization issues in a puppy simply because I have the advantage of being available to continually evaluate our Havanese puppies! Additionally, our strict selection process has allowed us to choose only the finest, most qualified Havanese breeding pairs. Our sires and dams must meet the breed standard, pass extensive health testing and have a non-aggressive, well-balanced personality. There is a delicate science to proper breeding. A professional breeder must never overlook the importance of genetics and lineage without risking disastrous consequences for both dog and family. It is essential for a breeder to understand this process. All Havanese puppies are raised in our home, puppies are weaned naturally. I use a holistic approach to rearing and choose natural, non-toxic alternatives whenever possible. We feed our dogs and puppies a holistic diet. Our vaccination program is based on the latest vaccination protocols and our dogs receive only core vaccinations. I am grateful to my mentors and friends, whom unselfishly provided me with knowledge and advice over the years. Like Lynn Baron, of Renaissance Coton Du Tulear here in Connecticut and Bridgitte Jespersen of Denmark. Thank you also to my very understanding partner and husband Mark and our two very helpful puppy assistants Lexie and Victoria. Above all, I thank the author of our lives, the Lord God Almighty for His blessings and bountiful provisions during this season of raising children and Havanese dogs. Thank you for learning about us!